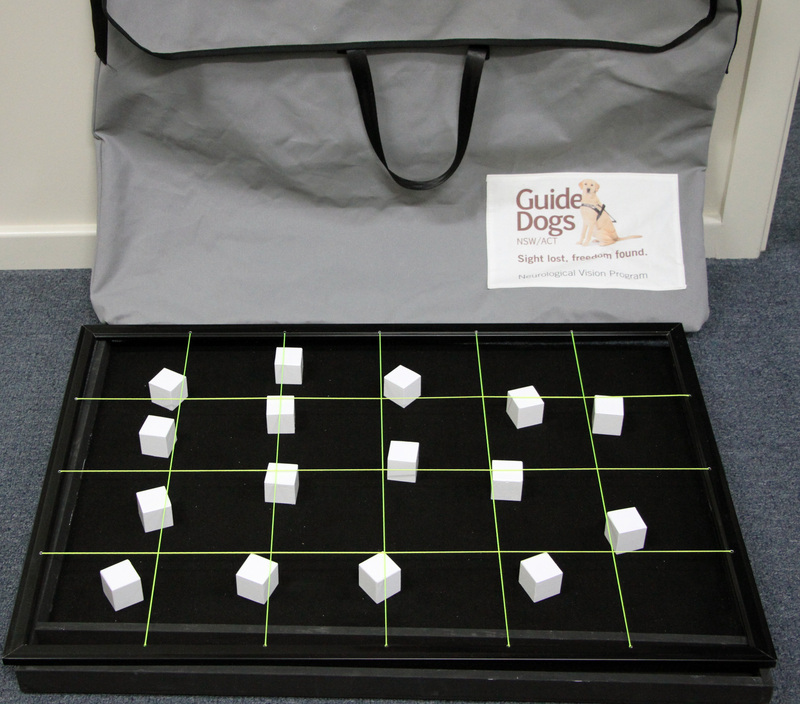 TAD received a project application from Guide Dogs NSW/ACT to replicate a therapeutic tool used for vision assessment. The project was known fondly as the ‘baking tray‘ and was a large flat board on which the patients were asked to arrange 16 blocks evenly. “This project was particularly interesting because the therapists at Guide Dogs had only ever seen one of these devices described in an old journal article from 1998,” said Colin from the TAD North West Volunteer Group. TAD’s North-West volunteers worked together to complete the project, now called a Visual Spatial Neglect (VSN) apparatus. Bruce Hattersley constructed an 80cm x 60cm tray of 7mm ply lined with felt and 30mm x 12mm pine edges. Marco Colli made the screen which would be placed over the tray to assess the patient’s work. Colin Hunter made the white blocks and produced the Guide Dogs’ logo on a material patch as a finishing touch to the project’s carry bag being made by Alan Stone and Judy Panter. Colin met with Guide Dogs last September to review the success of the prototype. Guide Dogs were very happy with the results. They’ve ordered a total of 10 VSN apparatus to be made by TAD. The North-West group have been busy fulfilling this request and the trays are set to be delivered shortly.